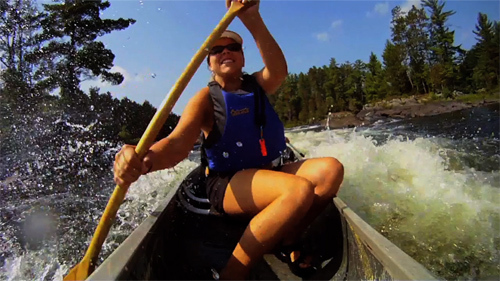 The Madawaska River in the Ottawa Valley is an amazing canoe adventure that has whitewater rapids, gentle paddling sections, and nice campsites. This 48 Hour Traveller Trip Clip gives you a snapshot of paddling down picturesque sections of this river. We are at a novice level of canoeing so this was a perfect weekend trip… although we went during low water season and caught a rock that sent us for a swim so make sure to scout your routes! We put in at Latchford Bridge and over two days paddled to the town of Griffith. 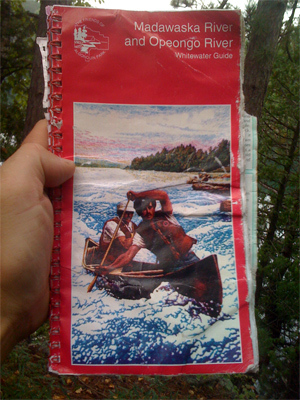 Trip Tips: Pick up the Madawaska River and Opeongo River Guide that has detailed maps to help outline your trip, showing portages and river conditions. You can pick it up at The Greater Madawaska Canoe Rentals/ Shuttle Service in Griffith. Talk to Don Adams and he will give you the lowdown of the river plus you can rent a canoe and use his shuttle services. Also, if you go on a non-long weekend you will have the river to yourself and fully enjoy the gorgeous campsites. During your paddle journey, you will pass through a series of Grade I-IV rapids (depending on season) and our favorite was the Snake Rapids section and Split Rock Rapids (first shot in video). Make sure to watch out for the Raquette rapids also known as the infamous “Canoe Eater” (yes this got us as shown in middle of video). There are a couple of recommended portages for paddlers at Slate and Highland falls. I have heard the experienced and brave try these sections with some being successful while others destroying their canoe. All in all this is a great canoe trip while in the Ottawa Valley!